Sethioz Industries Forum • View topic - 123flashchat exploits found VERSION 9. 123flashchat exploits found VERSION 9.
so i went to view history one time he was doing these things and i copied all of the following codes from him. Re: 123flashchat exploits found VERSION 9. I never messed with 123flashchat, but this is very common. WarZ was one of the games where you was able to use html code in the chat and as a result i was able to chat as SERVER or ADMIN and confused people. bit.ly/1jxQD1R < that's a link, copy paste into your browser's URL bar and see what happens. I think it kicks people because it's simply a massive file and causes some sort of overload on the client. no idea why they put them into code, i guess any .swf and image files will do same. has been created to request the cam/mic to be turned on, so if you link anyone to this, then it tries to enable your cam/mic. no idea why you need a smiley in front tho, maybe its because the way chat works, that if you have plain text, then chat system uses only text based, but if you include a smiley that requires chat to show an image, then this enables the chat system to load all other codes too. I wish there was a way around this! if smileys are off, are you still able to send images? 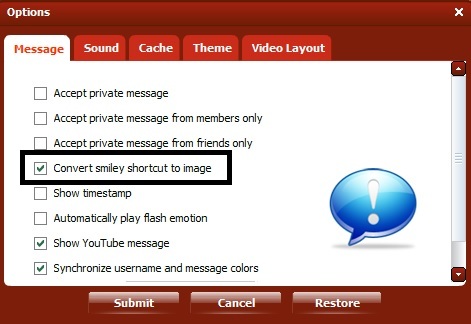 if yes, then any image will probably work, if no, you need to find a way to re-enable the smileys on their side. 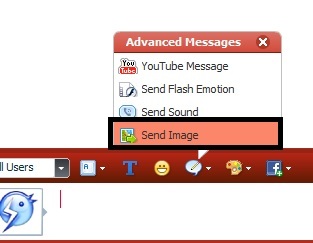 none of the codes in opening post work when smileys are off, i can send images using the normal chat interface (shown below) if thats what you mean? Still trying to figure a way around this. so if smileys are OFF, you are still able to send images and they show up? have you tried inserting image before the code, instead of smiley? Before i show you the results of your suggestion i found out something (not sure what i can do with this). 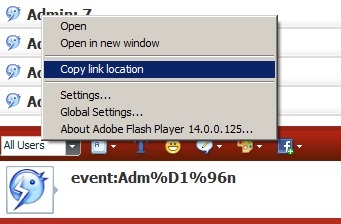 However i decided to right click my name and i noticed 'copy link location as you can see in pic, i pasted into the chatbox and it gave me that code (again im not sure what i can do with this). 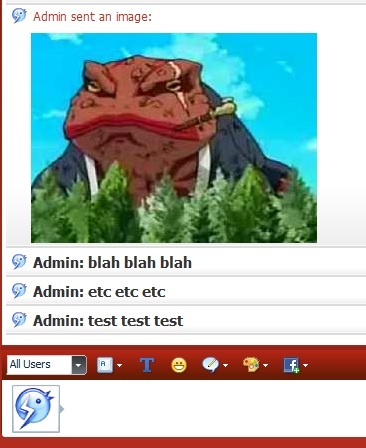 Below is a pic to show you an example of what 'send image' button does in the chatroom (i cant type and send image together i have to send image first typing is sent seperately). User = name of the 2nd account with smileys turned off. I could not get it to work unfortunetly :(. 1. I don't think it's "code", what is the admin username? i can't see cuz that box is on the way. I think that it's simply a http link and not a code. 2. ofcourse it doesn't work, because image + code has to be in same box. My idea is that smiley is same as image and it activates the "image feature" within the message, so if smileys are off, as result you see the raw code, because chat won't execute the code. If you can send image + code at same time, it should work. Try using packet editors, send image, then intercept the packet and after the image insert that code. i'm quite sure it will work. Use WebScarab, it should work great. You can read about it on my Knowledge Database if you don't know how to use it. Sethioz wrote: 1. I don't think it's "code", what is the admin username? i can't see cuz that box is on the way. I think that it's simply a http link and not a code. Oh it just says admin (i used a russian i to clone the username cuz if i type admin normall as username it doesnt let me just turns into admin84854 etc). Yeah that makes a lot of sense when you explain it that way. But just to 100% clairify for you this is how the chat interface looks when i send an image to someone. As you can see in order of them to see it they have to click the image. Ok i installed webscarab, i changed my browser to match the proxy and port for webscarab (127.0.0.1 port 8008) etc did everything to follow steps. Here are my results ( i probably did something wrong). 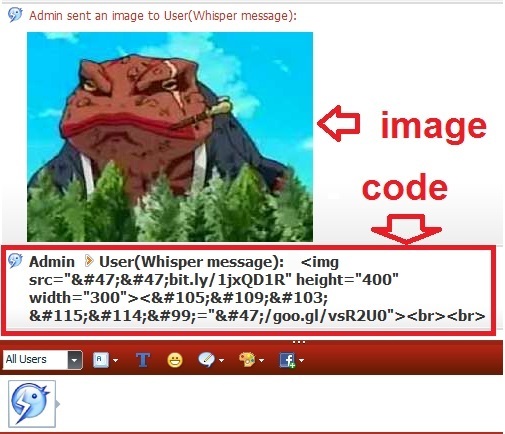 ok so i went to 'raw' tab and i tried to put the code in after the image url link (thats the link of the frog btw from few posts above as example) and said malinformed link. Now try and replace the image packet with image+code, keep in mind that if chat won't show the image unless they click on it, then most likely they have to click on it for the code to take effect. If doesn't work, compare those packets and see if there's anything different and if images/smileys can be enabled somehow. Also there's no need to intercept responses (response is what comes from server to your pc, so it would only affect you). and try using the Parsed tab instead of RAW, even tho both will work, Parsed is more user friendly, RAW has to be exact, if you make a mistake then packet will be useless and server drops it. here are my settings im using. I also have hidden fields checked as you can see from this pic here, however the chatroom itself shows no hidden fields (login page/profile pages do though but im only interested in the chatroom itself). Ok i unticked responses and used parsed data only as you can see from pictures, thanks for the tip :). I'm not familiar with webscarab settings but if its not the setting and If webscarab isnt intercepting text then try "tamper data" plugin on firefox and see if it does. But if WebScarab does intercept the text then stick to it as its better. There's also Paros Proxy. I recommend using win XP for all this, since win 7 is stupid, they have limited win7 a lot to prevent things like this. you can just install virtual pc + win xp, will work perfectly fine. Paros Proxy, Tamper Data and WebScarab are working better on win xp, i've had issues with all of them on win 7, they just act all weird sometimes and miss things. Well its been a long journey for me lol. 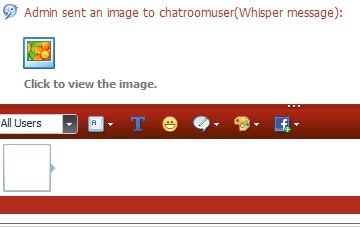 It seems they dont work on flashchat version 9. Thank you for all your help friend atleast i tried ^^. webscarab works 100%, so does tamper data, however the problem might be that it runs stand alone flash app on background, but you are trying to intercept browser traffic. You need to dig deeper, use process monitor (procmon) to see what files and programs your browser "touches" when you go into chat. 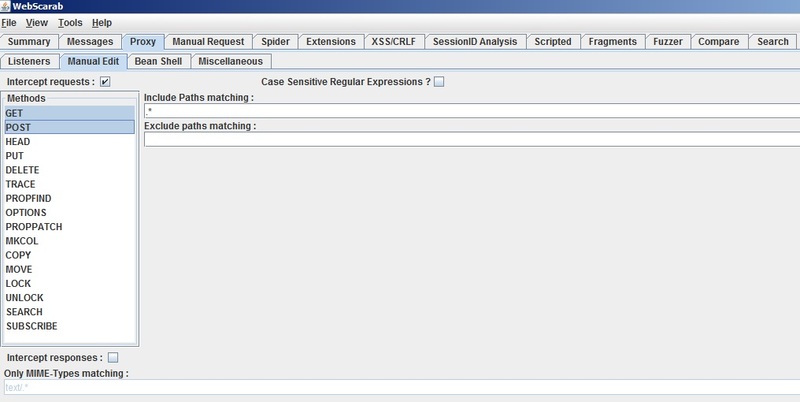 procmon is quite easy to use once you understand the filters/rules. You can filter out unwanted messages or filter them by app / path to get what you need. This way you can see if browser launches anything extra when you enter chatroom. You could also just check in task manager (i use process explorer, way better) if any new program is launched when you enter the chatroom. - if nothing, then enter chatroom and keep eye on processes, see if anything pops up. If still nothing, use some packet sniffers / editors to find the full path to the flash itself (chatroom should be like blabla.com/chatroom.swf"
and THEN, proxify that flash player, on XP you can use ProxyFirewall to proxify any program, push it through WebScarab and THEN you can intercept the data. Edit: You can also use CommView to intercept ALL of your network traffic, that way you WILL find the correct packet, however commview is not best for editing, so you still have to proxify the chat in order to tamper with the packets. CommView might just be easiest way of telling where the packet is coming from and where it's going, CommView has process filtering, so it shows which program.exe sends the packet.